Remember the bag I made? The Grandview Bag (link here)? Well, Layla was so excited about it that I made her a miniature version for a last minute Christmas present. I think she's gonna love it! I just had to make her one of those crayon rolls too. There are tutorials everywhere for these, but I used the one here at Chocolate on My Cranium. I did change the height to 7" instead of 5"...it just felt a little more substantial to me that way. Loving this Michael Miller bird fabric! I must be stopped! 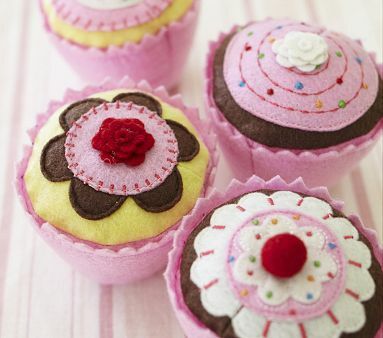 I saw these felt cupcakes in the Pottery Barn Kids catalog and just had to try to make some. I used the tutorial here at Sew Hip Mama for the basic construction. And finally, something that is NOT for Little Bean (if you can believe it)...aprons! I made a few of these and already sent them off, but here is the last one standing. These are so cute and a cinch to make. Here is the tutorial from Stop Staring and Start Sewing. Here's hoping none of the recipients read this blog! What gifts did you make for the holidays? You did a beautiful job on the apron!! I love seeing this (I'll bet the recipients did too)!